TheRedGoat: Honestly, Scroll Thief and Smuggler's Copter SEEM bad, but they consistently draw me into my lands and my control pieces. I'm never ever disappointed when I see them in my opener. Inundate isn't a bad idea XD but I'd rather just play Merchant Scroll / Spellseeker to grab Cyclonic Rift for example, in that slot. The other rattlesnakes are... okay? But I'd usually prefer outright control or counters in that slot (I don't like giving my opponents choices when I punish them). I tested Hidden Strings , Last Thoughts , and Hands of Binding , but they all got cut :( Last Thoughts is strictly worse than Scroll Thief in this list, and the other two were too low-impact overall. The issue with Sakashima's Student and Ninja of the Deep Hours is that they're only unblockable ONCE in this list (they have too large of a P/T to be unblockable here). Teferi's Veil and Siren Stormtamer might have a home here, avoiding removal? Honestly unsure, I've definitely considered both. Prying Blade ups my power, which I actively want to avoid XD Verity Circle might make it in here, it's been really REALLY good in The Locust God , though Rhystic Study would get that slot first. Murmuring Mystic could be cute I suppose (paired with Bident of Thassa ? wooooooo that seems hilarious). But Time Stop really isn't my jam in multiplayer: it makes me tap out and be unable to answer anything :( Thanks for the thoughts! TJFNIJ: Oh, that's cute XD I like that, but it's 10 mana before I get the pump effect (assuming I want to pay echo), so I think I may have to skip it for now. Have you consider the cipher spells : Hidden Strings , Hands of Binding ? Still an impressive piece of work I see. 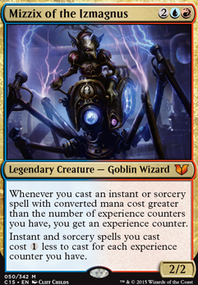 Smuggler's Copter and Scroll Thief seem like they take up slots better served by more utility or control effects. AEtherize and Inundate as board wipes or Dissipation Field or Crawlspace as rattlesnake cards (for multiplayer mind you). Hidden Strings , Last Thoughts , or Hands of Binding for control/utility purposes. Sakashima's Student feels like a two mana clone effect in your build. (for that matter, Ninja of the Deep Hours should equally be treated as a two drop). 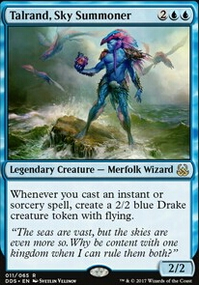 Teferi's Veil or Siren Stormtamer for creature protection. Prying Blade as completely unnecessary ramp. Military Intelligence or Verity Circle as card advantage. Murmuring Mystic or Psychic Corrosion (note, the enchantment represents any milling here) as win cons. and last but not least, Time Stop . Because nothing is more oppressive than hearing "beginning of your turn, end the turn." Hmm, I think I'd swap out 2 Hero's Downfall and 2 Dimir Keyrunefor it. I thought on some other changes I might make to the deck. Curious Obsession might be nice in place of Curiosity for those times you don't have an Inkfathom Witch. Also maybe 2 Hands of Binding for 2 Hidden Strings? 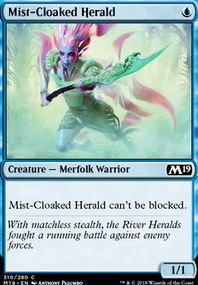 Slither Blade instead of Mist-Cloaked Herald; it's strictly better. Hands of Binding as a repeatable version of your removal spells. Mindlock Orb doesn't do anything; players will be fetching before turn four. If you're in a casual format, hardly anyone will be tutoring for anything. 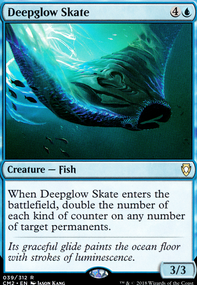 Excess copies beyond the first are literally useless, and wouldn't it just be better to counter what they tutor for? Ingest also does nothing. I would cut them in favor of cards that have relevant upsides, like Invisible Stalker or Augury Adept. Anyone worth their salt will not be tilted by Ingest as it has equal chances of helping/hurting them. Rune Snag or Mana Leak are far better than Cancel in 90% of circumstances. 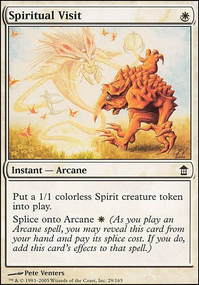 Any spell that your opponent can afford to pay the tax is likely too small for you to even care about countering, and if it's early game than they are indeed literal Counterspell. Rune Snag in particular scales well as the game goes on. Ordeal of Thassa gives you a payoff for attacking and speeds up your clock. If you have a lot of unblockable, you should add cards with Cipher in them such as Shadow Slice, Hands of Binding or Undercity Plague. 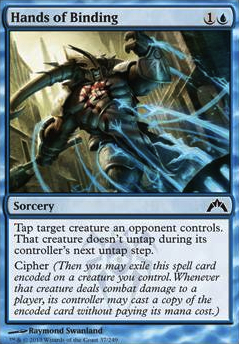 The cipher ability goes onto an unblockable creature and then you can always get an additional effect out of attacking. All of the cards that have cipher on them are U/B so check them out!